This picture encapsulates so much of my childhood and the bond between my father and me. It is a candid shot of us at one of my father's epic house parties. He threw one every weekend but this one was unparalleled. It was my 5th birthday. Undoubtedly, there was an amalgamation of Soukous music, Mtume, Rick James, Jimmy Cliff, and Bob Marley blaring out of my father’s JBL speakers in the background while he enjoyed the libation in his hand and his adiaha (eldest daughter) nestled between his legs. The following year, on Father’s Day, I lost a part of who my father was in this picture. "It's just a day that brings it all about. Just another day, nothing's any good." I made a covenant with myself. It was the oath I swore to myself when grief and its attendant emotions enveloped me. I needed to believe that Father’s Day was just another day. So, for many years, numbness was my choice emotion on that day. America's distorted views of fatherhood and manhood and utter disdain for fathers enabled me to seek false refuge in the lack of fanfare surrounding that day when compared to Mother's Day. I didn't want to feel what I felt on June 19, 2016 when grief besieged me and tore my tenuous covenant asunder. I don’t know why this year—of all the years—I wailed, wept, and moaned. Perhaps it was my graduation from seminary three weeks prior. Maybe it was due to my 34th birthday. 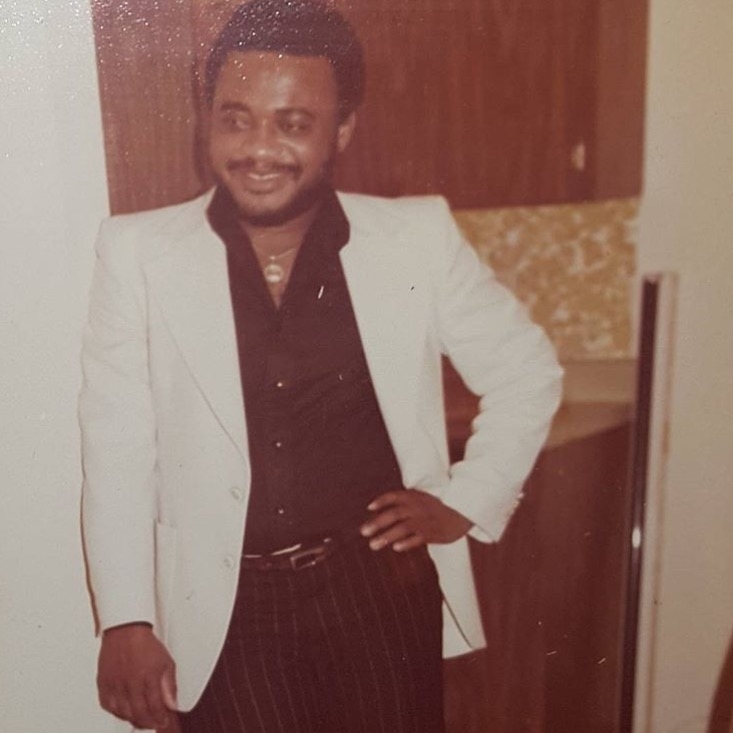 Or it could have been Black Twitter’s touching Father’s Day hashtag, #7DaysofBlackDads, that got me thinking about mine (although, there is never a day that passes when I do not think about my father). More than likely, it was a combination of all three. Or neither. Grief doesn’t need a reason to darken one’s door; it arrives unexpectedly, uninvited, and has its way. Fifteen years ago today, my Heavenly Father took my earthly father. July 1, 2001. That date is narrowly worse than the last time Father's Day fell on the dreadful date of June 19. I was only six years old. How could I have known that Father's Day of '88 was preparing me for July 1, 2001? At the age of 34, a tumor ruptured in my father's brain. It left him legally blind with long-term and short-term memory loss, to name just a few of the health problems he inherited as a result of that trauma. Not only did that tumor rupture my father's brain, snatching my father’s eyesight and health along with it, it plundered our family dynamic like a thief carrying a way someone’s most prized possession leaving a distorted picture in its wake. Functionally, my mom became a single parent and sole breadwinner due to my father's disability. I became a co-parent helping my mom raise my two younger sisters, run the household, and joined her in thinking through crucial decisions for our family. Several months prior to Father's Day of '88, my father obtained his Master's in Public Administration from Golden Gate University. He had a passion for politics and wanted to work for the government in some capacity. By the grace of God, he regained his long-term and most of his short-term memory. Yet and still, he did not recover his eyesight, which meant that my father could not work or take me and my sisters out for daddy-daughter dates at the park, movies, and football games like the other kids. But he found creative ways to exercise his political knowledge, and that meant teaching his three girls the way America works. He was the most brilliant man I have ever known. He knew every domestic and international current event and the historical context behind each. He was the best armchair political analyst I knew and I was always fascinated by his insight. His disability took hold in my formative years, forcing me to reimagine what fatherhood and manhood truly meant. For his part, blindness necessitated creative parenting. I was six years old and my father could not see me. Or maybe it was me who could not see him. For many years, I could not see that it was me who was blind all along. Blind to the ways that my father had molded me. Blind to the ways that he modeled what it meant to be a husband. Blind to the way that he instilled in me a love for God, church, politics, music, knowledge, reading, friends, and family. Complications from a stroke claimed my father’s life on July 1, 2001. One week after my maternal grandfather passed away, two days before his forty-seventh birthday and three days before my parents’ twentieth wedding anniversary. I was nineteen years old. I was far too young to know what I would do or who I would become. For fifteen years, I’ve been trying to tangibly piece together the ways in which I am like my father and I gain more clarity each year that passes. I inherited my father’s gregarious nature, curiosity, inquisitiveness, and even his style of dress. Just this week, my mother told me that my father was a writer. Even my engagement with the world is informed by his own. He never believed in the sacred and secular divide. Instead, he taught me that as a Christian, I must never fear this world because my Heavenly Father owns every square inch of it. He taught me not to shrink back from the world, but to press in and engage. He taught me never to settle for simple answers to complex questions and, for me in turn, not to shirk difficult questions. He nurtured my opinionated nature, always reminding me to make sure it is informed. From him, I learned to take strong principled stances on issues and to substantiate them using reason and facts. He raised me to be a strong, independent, black woman. He loved his Africanness and blackness, and taught me to love the same, because as far as he was concerned, the two are one. Above all else, he loved Jesus Christ and the church. From my father, I learned the meaning of Ecclesiastes 3:1-8. His life before and after the brain tumor made this passage come alive in new ways, but since his death, the meaning has been etched in my soul. I learned at a young age that time is fleeting and life is but a vapor, so I’ve grown accustomed to holding everything—except Jesus—loosely. I miss my father dearly and I know that he is worshiping Christ around His throne with the saints of old who have gone before Him. Yet, the grief remains because grief is a living experience. Amputees never get used to the loss of a limb. In fact, they sometimes experience pain and discomfort where their limb used to be. Like grief, the pain comes upon me suddenly and without warning and all I know to do is to bind unto myself the strong name of the Trinity and to run to my God who is a father to the fatherless. I do not draw comfort from lies about my father looking down on me or being a guardian angel—the Scriptures do not teach that. I allow myself to feel the grief, knowing that it is part of the suffering that comes with being in a fallen world and it has also been appointed to me (Phil. 1:29) by virtue of my union with Christ. Unbeknownst to me, I was in an apprenticeship with my father for nineteen brief years. My father shaped who I am now and who I am becoming. I’ve made a new covenant with myself, and the words engraved on his tombstone form the vow of that covenant: Think of me often, and with a smile.